I’m not sure where my teaspoon obsession started. But I think I’ll blame my parents. Seems logical since it was in their kitchen that I first noticed that stainless steel spoon with its slim silvery handle boldly stamped with the letters “BOAC” down the back. I realize now, of course, that there’s really nothing special about that spoon. But, as a four-year-old already fascinated by the miracle of flight and planes and travel, the mere fact that it had “somehow” been spirited off an airplane (sidenote for the young ‘uns: BOAC, or British Overseas Airways Corporation, was the precursor to what is now known as British Airways) and into our Kent, England kitchen’s cutlery drawer was magical. Just looking at it reminded me of my first plane ride, from England to Jamaica, when I informed my mother that the clouds were upside down, and our meals were served on a tray with a multitude of tiny plastic dishes that, like a jigsaw puzzle, fit perfectly into its rectangular shape. And actually using that spoon … well, to put it in my mouth was like transporting myself back to the climate-controlled cabin of my first flight, to relive the excitement of sitting amid the clouds, to experience again the thrill of going somewhere new. Which is, I suspect, the reason why I’m now a 50-year-old travel writer with a cornucopia of spoons threatening to escape the confines of her own cutlery drawer. As my professional life has taken me from resort to resort in the Caribbean and all over the world, I’ve become a practiced "liberator" of teaspoons. I’ve pinched them from posh restaurants from Canouan to Helsinki. I’ve plucked them from room service trays; folded them into my napkin and tucked them into my clutch; even wiped them clean and slipped them deftly into my “Jamaican purse” (AKA bra). Today I have a collection of more than 60 implements, “freed” from the bonds of their original homes in hotels and restaurants across the globe, now living the good life in my Miami condo’s kitchen. 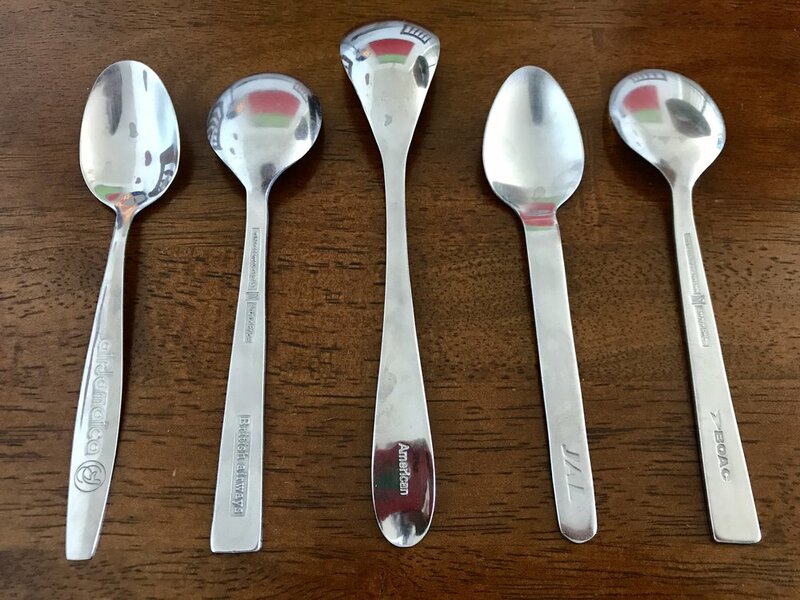 Of all of my beloved spoons, my “airline series” is most prized. Decades later, I still have the three BOAC spoons my parents somehow found in their possession. I also own a trio of their successors, British Airways spoons, exactly the same except for the name on the handle. I have a single elegant beauty from the now defunct Air Jamaica, and one from my current carrier of choice, American Airlines. And following a 50th-birthday trip to Tokyo, there are now not one but five JAL spoons nestled in the drawer. Others have earned a place in my collection not because they are marked with where they came from (truth be told, I hardly remember where most of them were found). I have them simply because I consider them beautiful. There’s the small wooden one (meant for salt, I think); the sleek metal-and-wood pair (lifted from a Nespresso coffee shop in New York City); the tiny specimen barely bigger than my little finger; and the mother-of-pearl beauty I dare not put in the dishwasher. 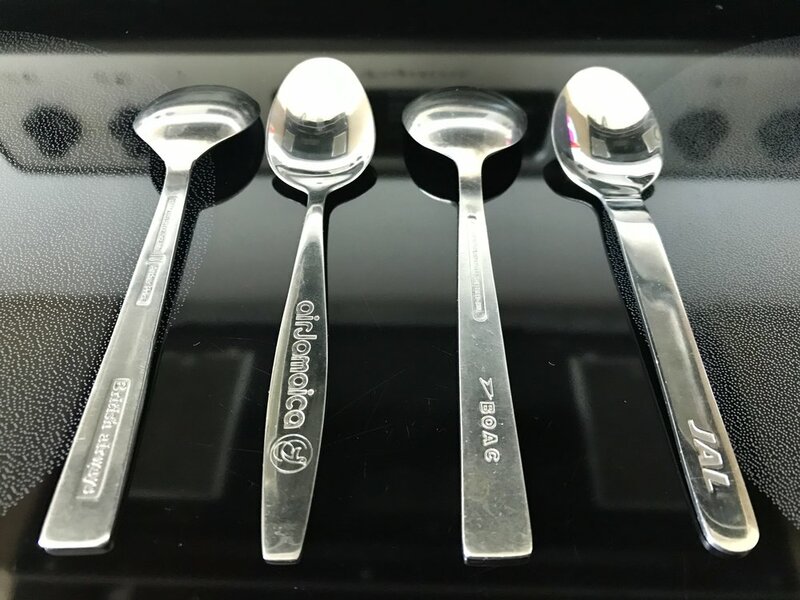 Over the years my teaspoon collection has expanded as my world has, to become a tabletop travelogue of my adventures in Asia, Australia, Europe, and my beloved Caribbean. I used to feel bad about my obsession, but today I embrace it. In the spectrum of things guests "acquire" from hotels, teaspoons seem pretty trivial to me. For me, teaspoons are both. And simply irresistible. Serenity Found in St. Lucia?